Hey guys! It’s Zigge back with another guide. For the last couple months, I’ve been busy studying and I also wanted to spend more time with family and friends. Anyhow, I will today give you best tips and decks when using the Hunter, which is by the way my new favorite defensive card. 24/1/18, decreased the range to 4 (from 5), and slightly decreased his bullet spread. 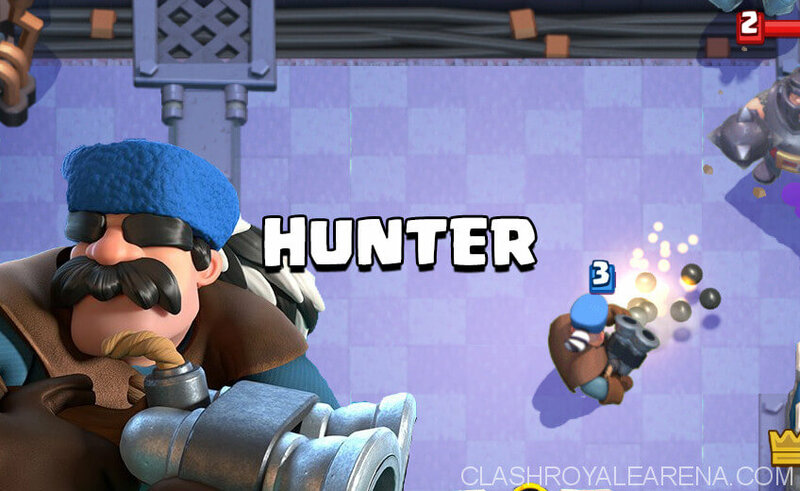 Many might think of comparing the Hunter to Executioner, but it’s quite the opposite. While Executioner throws his axe in a straight line, Hunter has a spray sort-of attack. Imagine it like all bullets coming out from the same spot, then spreading out in front of the Hunter, extending a bit further than his actual range (one of the only similarities to Executioner). Hunter also doesn’t benefit from Tornado at all, since his attacking is already spread out, so clumping all units together is just hurting you when playing Hunter. At a glance, it might look like Executioner is just the stronger card, but wait, there’s a lot more depth to it! Depending on how many or how strong the attacking units are, you can place the Hunter at different ranges to maximize efficiency. This may sound counter-intuitive to you, since he’s a ranged card and should therefore be played as far away from your opponent’s units as possible to make the most out of his range. But as a matter of fact, if he’s right on top of an enemy unit, his bullets will all go onto the same target, since the don’t have a chance to spread out before hitting the enemy. The Hunter is an absolute beast on defense and can take out most units. The fact that you can either have him as a DPS card or a ranged splash damage card makes for insane versatility on defense, and he can counter nearly every card in the game. If all 10 of his bullets hit, that’s between Mini P.E.K.K.A and Lumberjack DPS, even with his slow hitspeed. For example, against a Knight, the Hunter will easily win if you place him a little closer to the Knight, allowing most if not all of his bullets to hit at the same time. This is a great pairing with Ice Spirit, since it let’s you play the Ice Spirit, then the Hunter on top of the opposing Knight. This way, their Knight won’t get the first hit and it gives your Hunter an edge in the duel. The opposite is also true, against a Skeleton Army, place him as far away as possible to make the most out of his spread bullets. They will quickly take out the skeletons, especially if they’re just walking over the bridge so they’re not able to surround the Hunter. In between a Knight and a Skeleton Army, we have Goblin Gang! Place the Hunter at medium range, so most of his bullets hit the Goblins and Spear Goblins, but not so close that he’ll get surrounded and killed. With everything you have heard so far, you might think that this is the most overpowered card in the game, but truth is, he’s very weak on offense. Due to his spread attack, he does very little damage to an arena tower, with only 2-3 bullets hitting. He also is very easy to counter with a Lightning or Fireball+Zap combo. Even though he counters a Skeleton Army well on defense, on offense he just gets surrounded and killed before being able to do any severe damage to it. 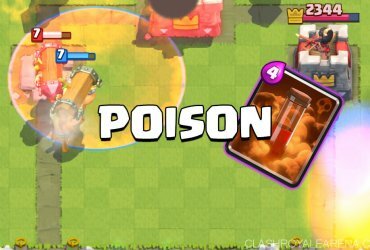 For four Elixir though, he has a lot of health and will actually take out a Mini P.E.K.K.A if it’s dropped on top of the Hunter. Therefore, it’s best to treat the Hunter more as a Mini P.E.K.K.A than a Wizard, since you will most likely be defending by dropping stuff on top of him. It’s very easy to surround a Hunter, and if placed right Goblins can completely take him out. Because of his larger hitbox, this isn’t much of a challenge. This deck is currently used by betelgeuse (Nova player) and tested by me via Challenges. This is nothing but a variation of Miner Poison deck where Hunter replaces Inferno Tower and Tornado added to gain more value out of Hunter by bringing all troop near Hunter and using Ice Spirit so that Hunter can melt em all. 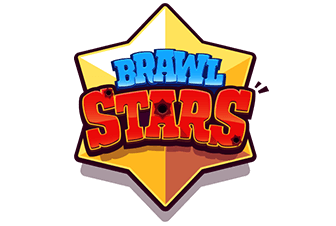 The objective is to get as many Miner Poison as possible while defending with the remaining troops. This deck is currently used by Electr1fy. After playing few matches with it, I felt that this deck being no different than any other X-Bow deck until I faced some beatdown decks. Beatdown decks never felt like real hard counter while having Hunter in this deck. He helps melting Golem, Giant etc while Guards help me distract opponent’s Inferno placed to kill our X-Bow which would otherwise not be possible without Hunter’s high DPS. This card completely nullifies the only hard counter X-Bow has. This deck is currently used by Hatcher (a famous player from Crucible Wrath). 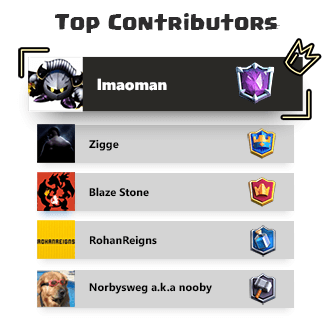 This deck is the variation of Mega Knight Miner control deck. Believe me guys, this is by far my favorite deck. It was so much fun playing with this deck. Flying Machine can be used to snipe buildings. This deck was played by SirTagCR (so Pero) in one of his video (below) where he showcased a beautiful Graveyard control deck with Hunter. 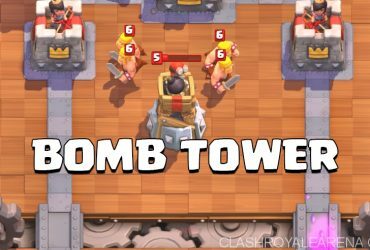 As he said in the video, Hunter complements Mega Knight as Hunter melts tanks which will improve the decks quality by overcoming its weakness. This deck was played by Nova I Oktay (famous ladder player) and was showcased in a CWA’s video. To be honest, I am not a great fan of this deck just because it requires too much skill to get it to work and 1 misplay will easily cost you the game. Nevertheless, a fun deck to toy around and It was played by a top player in a 2k card tourney. Must be good! This deck is nothing but 2.6 Hog cycle deck with Hunter instead of Musketeer. This deck has its own advantages and disadvantages. Beatdown decks with huge tanks can be dealt with easily with our Hunter. Disadvantage is that due to its cheap cycle so much decisions has to be made and a small mistake may cost us the game. Feel free to leave your thoughts in the comments and whether you agree or disagree with me. I will do my best to answer them as quickly as possible, in a few days I will have my favorite Giant Hunter deck coming out, stay tuned! Just the Zigge y'all know, friendly and respectful.